This album page provides links to galleries that display images of Passerida oscines from the order Passeriformes that I photographed in various natural habitats. 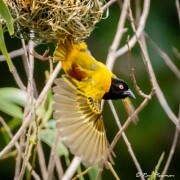 In each photo album a gallery features portraits of individual species that may include male, female, juvenile or immature birds and for some species a supplementary gallery displays behaviours such as hunting, nesting, feeding and mating. 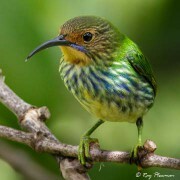 These small bird species inhabit most vegetated areas in tropical regions of the Old-World including forests, mangroves and gardens. 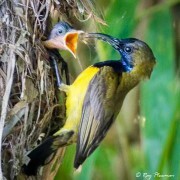 A photo essay of olive-backed sunbirds in their habitat; nest building, incubating eggs and feeding their chicks, including behaviours and action photographs of several species. These oscines occupy a variety of habitats including woodland, forest, marshes and gardens. Waxbills are small short-billed oscines while Weavers are small to medium sized birds that have slender to heavy-set bills. 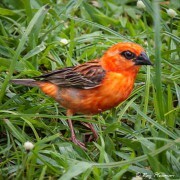 Features a gallery showing some behaviours of three waxbill species together with three photo essays of baya, golden and village weaver nesting behaviour. These four families are small to very-small oscines that generally prefer habitat where small seeds and insects are plentiful especially in the breeding season. 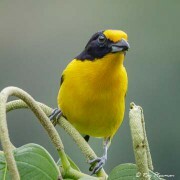 Blackbirds vary from small to medium-large while tanagers are small to very-small oscines. Both families populate a wide range of terrestrial New World habitats. 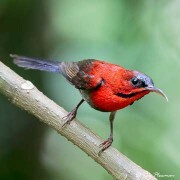 1 Sibley and Ahlquist Taxonomy places sunbirds and spider-hunters (Nectariniidae) together with flower-peckers (Dicaeidae) in superfamily Passeroidea while other taxonomists place them in a basal Passeroidea grouping.